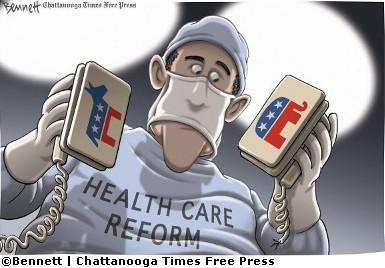 Personally, I have only a vague idea what Health Care Reform is suppose to be reforming. Whether it's to cap the insurance providers' administration cost or limit their profits. Or to require that the uninsured insure themselves so the public doesn't have to foot the medical expenses using the same rationale as mandatory auto insurance. Or to provide people who can't afford to buy health insurance themselves with free universal health insurance. One thing that I find intriguing is that the people reporting on it on tv probably all have health insurance themselves through their employers. They couldn't care either way on health care reform asides from the fact that the topic just happens to be news worthy at the moment.